The practice of tipping is one of the most irrational, un-economic behaviors we engage in. It’s not in our economic best-interest to tip; essentially we do it because it’s a social norm — a nicety. In this episode of Freakonomics Radio, Stephen Dubner looks at why we tip, what kinds of things can nudge tips upward, and what’s wrong with tipping overall. 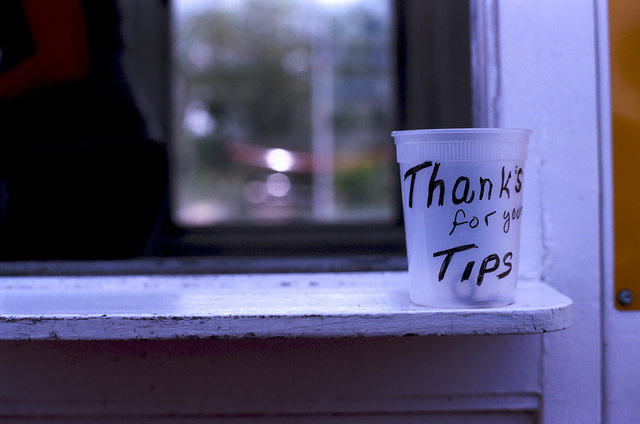 In the end, we wonder whether or not the practice of tipping should be eliminated altogether. Research shows that African American waiters make less in tips than people of other races, so tipping is a discriminatory practice. Later in the hour: if your parent has the gene for Huntington’s disease you have a 50% chance of getting it yourself. Huntington’s is a debilitating fatal disorder. People can do genetic testing to see if they will fall ill, yet only 5% of people choose to do so. Stephen Dubner talks to University of Chicago economist Emily Oster about her research on Huntington’s genetic testing, and the value of not knowing your fate. "Research shows that African American waiters make less in tips than people of other races, so tipping is a discriminatory practice" This is a very foolish sentence. Illogical too. And sloppy in (lack of any common) definition. Provocatively worded, perhaps, but neither foolish nor sloppy. Listen to the audio. We should also ban education, since it's clearly discriminatory: black students have worse results. You heard the man: even legitimate business practices, such as providing education, are illegal if they impact a protected class. Instead of hiding racism under the rug and banning things that remind us racism exists, how about seeking out it's causes ? The corruption-tipping correlation segment is ridiculous. How exactly is tipping "leaking over" to corruption, especially in light of the fact that in US the correlation is reversed ? This was my first and last listen of your show, it's pace is EXCRUCIATINGLY slow. Allot of small talk, pauses etc. and too little substance. But I take issue with your assertion that the correlation of tipping-corruption is reversed in the U.S. Initially, the same thought came to my mind, as you did. But I would like you to to look at it at a slightly different angle. In most parts of the world (developed and otherwise) lobbying and campaign contributions are banned or extremely transparent with set limits on campaign contribution. But that doesn't mean corruptions don't exist in those countries. Far from it, when they surface they go gang busters. And those politicians who show any sign of impropriety, they are invariably punished. And I used to be all for legalizing lobbying in my country of birth, as in the U.S. But there is a dark side to lobbying. In the guise of "legality" lobbies by interest groups have pretty much paid off our politicians. And the PEOPLE have become indifferent, which is a very dangerous thing in a participatory democracy. In the end, it's all about who is holding the most amount of "tips" (campaign contribution). We are not so naive as to believe the politicians when they say that their votes aren't swayed by campaign money, are we? I worked at a restaurant as a waitress for 3 years and found that African Americans and Hispanics typically tipped me, a white, blonde, female, less. However, taking into consideration it was "country cooking", and I typically only had one or two ethnic customers in a week, it can't be a very valid sampling. All of you who are so disturbed about the descriptor about tipping being discriminatory...take ten minutes to LISTEN TO THE BLOODY PODCAST!!! The idea that quality of service has little to no impact on the percentage of tips received is absolutely true. But what you fail to note, is that better service often yields higher sales. Of course the goal of any good server or bartender is to take and deliver your order accurately, but more importantly, he or she will strive to make you feel comfortable and gain your trust. Guests who are comfortable and feel well taken care of then are more likely to take the server's suggested up-sell--an extra side of bacon, that slightly more expensive bottle of wine, etc. Most often, this will result in a guest having a much more pleasant, fulfilling experience, and even if such a satisfied guest leaves less than 20%, that guest likely spent much more than a table that had a less satisfactory experience and felt obligated to leave a big tip (for whatever reason). Additionally, the satisfied guest will more likely return for that experience and share that it with friends and family. Good service is a long-sell, but pays much higher dividends in both overall tips and sales, simply by practicing sincere hospitality. Thanks for your time, and keep up the good work! Coming from a non-tipping country, I find it extremely uncomfortable to tip. I do not understand why the onus is not being put on the employer to adequately pay their employees. I'm also assuming that tips are 'cash in hand' and outside of the tax system therefore government is missing out on revenue. It's true the restaurant industry in the United States can pay their wait staff well below minimum wage on the assumption that tips will augment their low salary. In large parties of around five or more, most restaurants automatically add a 15-20% gratuity fee onto the check. Tips is actually an acronym; TIPS=To Insure Prompt Service. Yes, tips are generally cash in hand, however, they must report their tips to the restaurant where it is reported to the IRS and taxed, which is reflected in their weekly paycheck. as a server, i have said tipping is the worst for years. sound crazy? your waiter/waitress makes $2.63 an hour and then any tips they make. the irs taxes us based on our sales, hear that people? that means if you stiff me on a 100 dollar tab, i pay taxes on it as if you had tipped. guess what? that happens...alot. servers now more than anything else are salespeople, and our pay should be like any other salepeople...commission based. a waitress also has to give a large percentage of his/her tips to Pay the bartender, busboy and or host. so if you dont tip me, they still get up to a third of my SALES, NOT TIPS, SALES. That is why not tipping really can be considered stealing, legally being able to not pay for a service and yet taxing for money not earned is insane. make resturaunts PAY their employees a fair wage for their services, and like any other saleperson, pay commision. I was very disappointed by this story. Simply, the right questions were not being asked by the host, and while I accept the irrational nature (to economists) of tipping, and that it can clearly lead to a culture of bribery, there was little mention of the fact that millions of people currently depend on tips to pay their bills, feed their families and enjoy a drink after work. The host mentions that the $40 billion per year in tips would pay for 2 NASA's. Well no, those $40 billion is household income that Americans are in desperate need of. If we want to change the culture of tipping, lets start by raising the minimum wage nationwide. Simple as that. This was an interesting episode which just showed up on my Stitcher today as a rebroadcast. A few thoughts. First, the tipping statistics across countries seem to indicate that higher income disparity may correlate with increased tipping behaviors--it would be an interesting relationship to formally study. So, tipping may serve the purpose of giving higher income people a "noblesse oblige" opportunity to bless lower income people who serve them. Is that a bad thing? Perhaps being uncomfortable with tipping correlates with a desire for income equality and the use of intermediaries to achieve it. I think tipping drives more direct person to person interaction across classes of people, which is a good thing in our increasingly segmented society. Also, I prefer that individuals make their own decisions about how they spend their money, and I fully agree that in the USA it is a person's responsibility to plan for tipping. We should be focused more on the present moment and the people around us. Keep up the great work on the podcast guys! Why is tipping considered the problem behavior? We should be more irritated that employers in industries that traditionally accept tips have been allowed to pay their employees less. If you're making enough in your normal paycheck to live at a decent standard of living, it matters a lot less whether that jerk customer at table 5 hates black people and left you a penny. If they banned tipping tomorrow that'd be great for all the Scrooges out there in the world but if I want to just hand someone some money, isn't that my choice? Why criminalize that behavior? Funny how we get all libertarian about the right to keep money to oneself but not the right to give it away. Why is that? I am so surprised that they did not include the fact that many workers make so little. Restaurant workers only make $2.13 per hour and tips are supposed to make up for that. Of course it doesn't work. These workers make so little money that tips are critical to their survival. I think that restaurants workers jobs should be subject to normal minimum wages. Also tipping should be mandatory for workers who are excluded from minimum wage. Just include the tip in the bill and inform the customers. This comment is specifically about tipping in the food industry. I was surprised to hear a lack of discussion on the equality of tips as it relates to sales. As many, though not all, diners tip based on a percentage of their total check, servers who work in more expensive restaurants will inherently make more money in tips. Also, servers who serve dinner, which is often accompanied by alcohol, will also make considerably more than servers who work breakfast (coffee) or lunch (soda). The entrees and the drinks at the first two meals of the day are consistently cheaper than dinner entrees and drinks, and so servers who work in the early part of the day inherently make less money, no matter how hard they work. The percentage system is completely biased and inequitable.